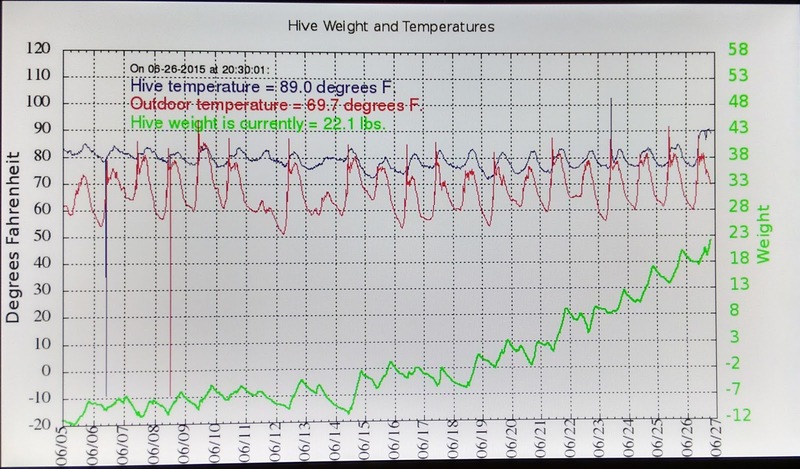 This is a graph of a hive started at Warner Nature's Center. It was a 2 lb package that was installed on a scale. The package was installed with a feeder pail on and a pollen patty. There was some honey in the hive. The scale was then zeroed. The weight is on the right. You can see the hive was at a negative number from were it started due to the feeder pail being off and honey consumption. It starts in early June at a negative 12 lbs from the start of zero. You can see the graph creeping up. Notice the rise and fall of honey weight with the daily temperatures. There are minor honey flows going on in early June. As the temperature goes up so does the weight of the hive with new nectar coming in. The weight goes down slightly overnight as water is evaporated from the nectar and the consumption of the nectar by the bees themselves. Notice on the graph 6/15 it is clear the main nectar flow has started at Warner Nature's Center, which is near Square Lake in northern Washington County. From 6/15 to 6/27 the hive has increased its weight by about 35 lbs in twelve days. That is about the amount of honey of one medium super. Warner Nature's Center has open fields nearby and has a good amount of trees. It will be interesting to see if the weight goes up much when the Basswood trees open. As of today the Basswoods have not flowered in our rural area. That should change any day now. 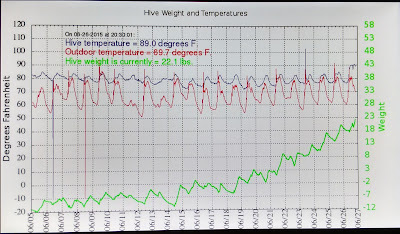 The inside hive temperature fluctuates around 5-7 degrees while the outside temperature has a 20 degree swing between night and day. I saw White Sweet Clover starting to bloom in the Stillwater area. This is one of our main nectar plants. also many nectar plants are starting or getting ready to bloom. I had a beekeeper that had his bees flying around the front of his hive in large numbers. He felt swarming was imminent. He called me and asked what he should do. He has several hives. I told him to got out immediately an switch the swarming colony with a weaker hive. So he moved swarm Hive A to weak Hive B. Then weak Hive B to swarm Hive A. He then went through the hive that wanted to swarm and removed the swarm cells. Now the field bees fly back to where they think they live. Hive B the weak one, gets all the field bees from Hive A and now gets stronger. Hive A the strong hive gets the field bees from Hive B and now gets weaker. This solves swarming issues immediately. Now Hive B needs to be watched for swarming because it will be stronger. The beekeeper was lucky he was home and saw this in the morning. By noon the bees may have swarmed. There is still swarming happening out there. I have had two call this morning already and calls during the week. The nectar flow is happening but it still hasn't got the full attention of the bees. Rainy weather when it keeps the bees inside the hive brings out an increased likelihood of swarming. A seven day inspection schedule for swarm cells may keep your bees in the hive. Many beekeepers are in denial when I tell them their bees have probably swarmed. A beekeeper will look in the hive and see a large numbers of bees and they think the bees couldn't have swarmed. The thing to realize is, it is the field bees that leave. The bees that stayed behind cannot fly yet and are unable to leave with the swarm. When we are looking at a colony during the day, propably 80% of the field bees are gone at any time during a sunny day. If you looked in a colony a half hour after sunset, you would then see all the bees in the hive. After discussing what their hives looked like, they usually come to agreement that yes their hive did swarm. Queen cells somewhere in the hive. The queen cells usually on the bottom of the frames but they can be anywhere. 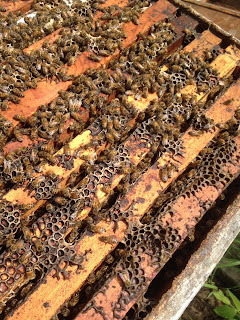 As you remove queen cells during inspections, the bees will get tricky and make one where you are not looking. 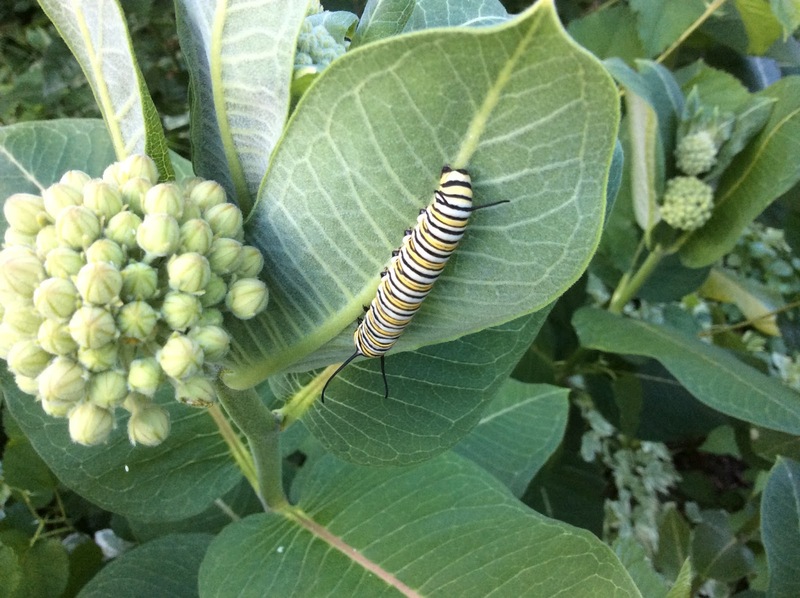 Absence of eggs and young larvae. The queen stopped laying, her abdomen shrinks anticipating flying off with the swarm. Usually you will notice only very old larvae or only capped brood. The brood boxes are filling up with nectar. The bees that stayed will start foraging as they get to the right age and the nectar they bring back fills the brood boxes. Few bees in the supers. Beekeepers blame no honey in the supers on queen excluders. But the real reason is their hive has swarmed. It is the denial thing again. If you see capped swarm cells now, you can scrape off the queen cells and call Olivarez Honey Bees for a queen or you can let nature take its course and leave the queen cells alone so they will raise their own queen. A hive can make a queen in MN usually anytime after June 10th. Before that time, a queen would have to be purchased to assure it was properly mated. There is plenty of time for the bees to recover their population before winter. But the hive will not make any excess honey for the beekeeper. If the hive is light on honey stores in mid August. The honey supers should be taken off and feeding of heavy syrup or ProSweet should start then. Waiting to feed later may make it hard to get enough food into the hive before winter. Everyone should be experiencing a nectar flow right now in the lower half of MN. My Basswood trees in Stillwater area have not flowered yet. I can see they are getting close with some cracks in the flower pod. I can see the yellow flower head. So I think the bloom is imminent. 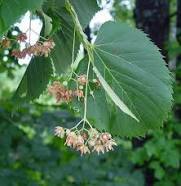 We did not have Basswood flowers last year. All of the flowers fell off the trees around the state before the flowers opened. This is a pic from S. Alms from southern MN where the Basswoods have just flowered. I see, as I travel around the Stillwater area. Yellow Sweet clover, White Dutch Clover and Bird's Foot Trefoil is blooming everywhere. Sumac is also starting to bloom. Many flowering plants are starting to pop up everywhere. 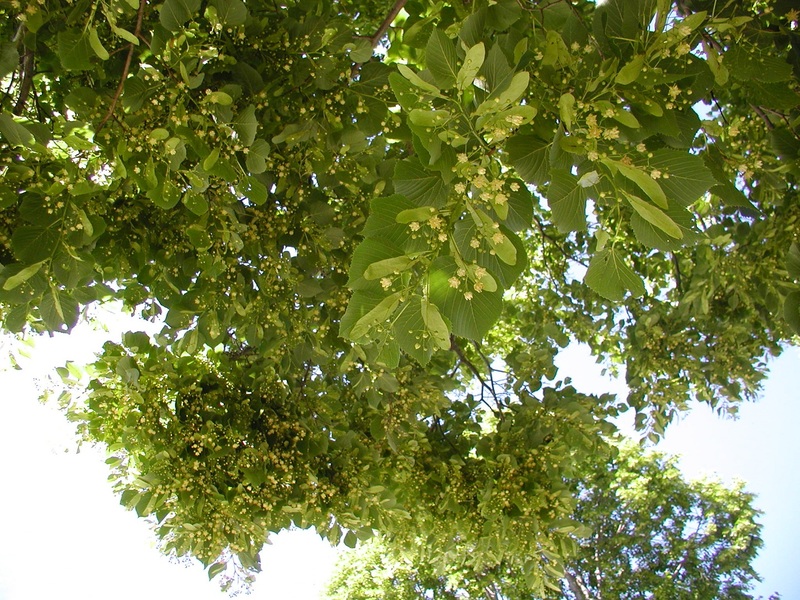 My Basswood trees have not bloomed yet but that may be getting close or is happening in the cities or the southwestern suburbs. Swarming is a concern still. Strong hives that get cooped up with a rainy period may get the swarming impulse going. Looking for swarm cells is still a good idea until we get further into the main nectar flow. All entrance reducers should be out and supers should be on. We are sold out of queens for 2015. I went out to check my yard in my back yard for bear damage being a bear was spotted at the neighbors. My bear fence was kryptonite to the bear. He shall not pass! While I was happy with my new fencer I thought I would check for a nectar flow. Low and behold white comb and they were filling the top deep. The flow must have just started because frames were not full but now comb was growing everywhere. I have clover and birdsfoot trefoil in bloom around the beeyard. You can see the new white wax being added on top of the brown burr comb. This is an indication that a nectar flow is on. Looking down into the edge of the frames. New white comb is being build and the bees are capping the new honey with new white beeswax. You can see the inside frames are being filled. The outside frames are being worked on with new comb under construction. There are no feeders on so the bees are getting this from the flower source. Colonies are building up quickly now. Everyday more and more bees are emerging. Bees are in all boxes now. New beekeepers should have two deep boxes fully drawn out by now or close to it. Some hives may have their third box on. Now with the population ramping up in the hive, bees will be drawing out comb much faster. A deep box put on today, should be all drawn out in the next 10 days as long as the beekeeper is feeding. Compared to a month it took to draw out the first box. The nectar flow is creeping up. Black Locust trees are waning. Yellow Sweet Clover is blooming across the metro area. Usually yellow sweet clover doesn't produce much nectar in this part of the state. In the Dakota's it is "THE" honey plant. I did see some Alsike clover blooming next to my garage but no where else at the moment. Basswood trees have dropped their flower pods. The flower pods are not displaying any flowers. I imagine the may bloom early. Normally Basswoods bloom around the first of July. Right now it appears the Basswoods may be blooming a little earlier than usual. Everything looks like it is going to fire up soon. Supers should be on now. If a beekeeper is still drawing foundation, check the hive every five days to see where the bees are at on drawing comb. When the top deep is finished or close to it. If it is not heavy with honey, do a reversal and put your supers on. If the top deep is heavy with honey it is too late to do a reversal and run the hive the way it is. Put the supers on. In general, supers go on two at a time. When drawing foundation put new supers always directly above the brood box. They will draw out the comb better. Check supers weekly. A strong hive with a good nectar flow will be able to draw out, fill and cap a whole honey super in a week. That is about 35 lbs of honey. All we need now are some 85 degree days. I found a fitbit today in my driveway. If it is yours, call me. I was from one of my customers from today. 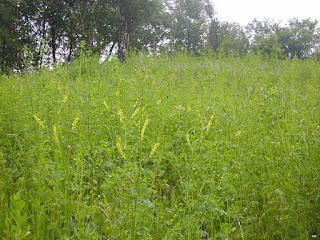 Sara from Red Wing took this pic of Yellow Sweet Clover blooming in Red Wing, MN. I saw some Yellow Sweet Clover blooming on Hwy 36 yesterday. Sara thought it was a little early. I tend to agree. I thought it usually was blooming around June 15th. 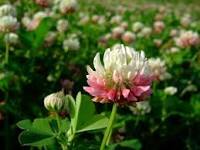 The old adage is: that the nectar flow starts about 10 days after the first clover bloom is seen. That puts our main nectar flow starting around June 15th. Supers should be on over wintered colonies now. When the package bees from this spring are close to being done with drawing foundation, do a reversal if the top box is not full of honey. If the top box is heavy with honey do not do the reversal. Put two supers on the package bee hive. Like Basil Furgala said "you can't make any honey if your supers are in the garage". My newest shipment of queens have arrived. I had a request from Clare in Rhode Island to clarify my position and answer her questions. Everything I talk about on this blog is what is happening in Minnesota. Our nectar flows can be very intense. With a colony filling and capping a honey super in a week when the nectar flow is intense. This same bee activity is happening basically all around the upper midwest. We start our new colonies with 10 frames. 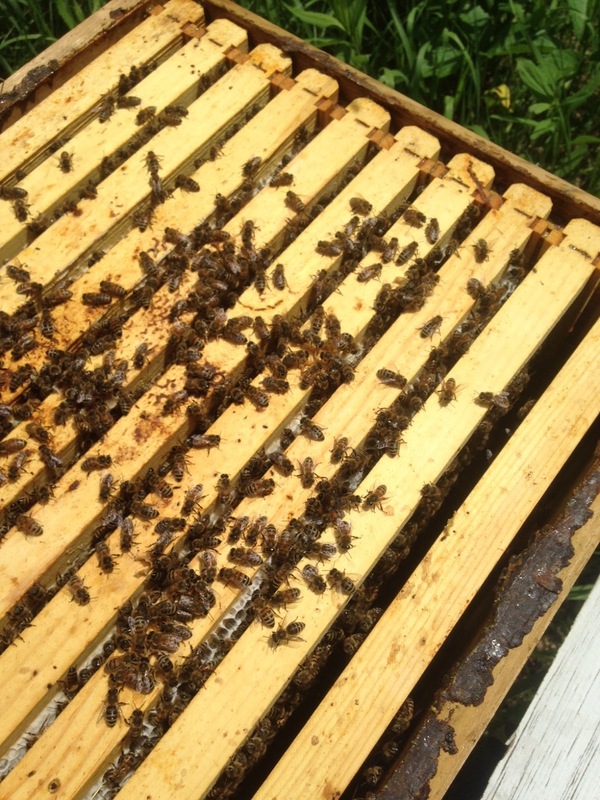 When the colonies are done drawing foundation, one frame is removed and 9 frames are used in the brood box. There would be no advantage to running anything less than nine frames in the brood box because we need 9 frames for winter stores of honey and pollen. Once you go to eight frames it is easier to have winter mortality because of insufficient winter stores. Many beekeepers use three deeps around here. The three deeps increase the amount of stores of pollen and honey in a colony and can help keep the swarming impulse down. We do several reversals on strong over wintered colonies in a the time before the main nectar flow. This helps spread the pollen and honey around the hive. Before the main nectar flow starts, reversals stop. 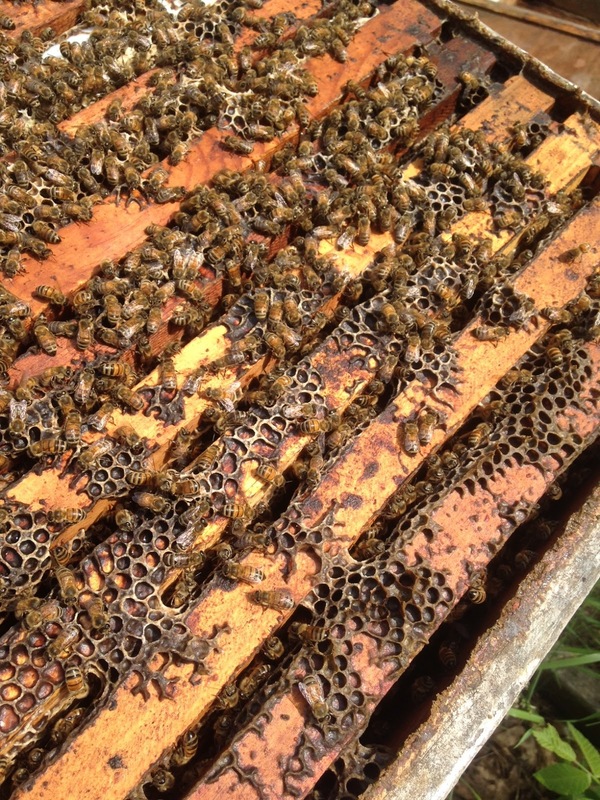 When the flow starts we want the bees to fill the top deep with honey for winter stores. In MN we need the top deep full and the box below should have four frames of honey for colony winter survival. Once the nectar flow is started, a queen excluder and two honey supers are added. Supers are always added two at a time. Supers with foundation are always put directly above the brood nest. Drawn comb supers can be stacked on top as needed. Some beekeepers don't like excluders, some use then all the time. Usually when a beekeepers uses an excluder and they get no honey, they blame the excluder. The reason they did not get honey is usually their bees have swarmed and they don't know it or the nectar flow was poor. If a beekeeper does not want to use an excluder. They need to wait until the top brood box is filling with honey, Once the box has some honey in most of the frames the thought is, the queen does not like to cross the frames of honey and will stay down in the lower brood box. I use queen excluders on my 35 colonies and they work for me. I know a few large commercial beekeepers (7000 hives) that use them. I always figure when it is your day job you usually know what you are doing. 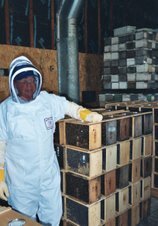 The commercial beekeepers have a lot on the line and have to make proper decisions to stay in business. Beekeepers are always wondering why their bees swarm. If we look at the causes it becomes easier to minimize the swarming behavior. Old queen. A queen that has been through one winter is looked as old to a colony of bees. Swarming is nature's way of replacing the old queen with a new queen. The odds of a colony making it through the next winter is greatly enhanced if there is a new young queen in the hive. The odds of a swarm making it through the winter is usually not very good in MN. Requeening an overwintered colony lessens this swarming impulse. Heat/Overcrowding. An over wintered colony is always subject to overcrowding. Dividing a colony helps keep the numbers of bees more manageable. A strong colony is the ticket to a big honey crop. So swarm control management practices need to be employed. Keeping grass down in front of hives so the bees can cool their hives easier. Removing entrance reducers for better air flow. Giving bees more room. Boxes with foundation is not considered room. Bees usually will not occupy foundation boxes in large numbers unless they are being fed or a nectar flow is on. Drawn comb is considered room. Overcrowding can happen in any colony of bees if it is not being managed properly. No nectar flow. Large colonies with no nectar flow can swarm at anytime. A bad nectar year kicks up swarming to a higher level. It is like the bees think they will not survive and leave for possible a better chance of survival. Mites/Absconding. High level of Varroa causes absconding of a colony. This usually happens in late fall but can happen on an overwintered colony with a high mite count. Example, A colony inspected in early October may look great but a return inspection in mid October may reveal an empty hive with not a single bee in the hive. Treating for Varroa in mid August will usually prevent this from happening. Management practices of looking for swarm cell in colonies once a week through the month of June will help prevent swarming. Cutting out swarm cells before they are capped is proper management. Once a swarm cell is capped the colony usually swarms. Removing capped swarm cells will eliminate any queens from coming back into the hive. A new queen would need to be purchased to get a queen into the hive. Buying a new queen is usually a better fix than letting a hive make their own queen. A purchased queen will give a colony eggs in 10 to 14 days. Colonies that have swarm cells can easily be fixed by cutting out all the swarm cells, then switch the colony's location with a weaker colony. This removes the large field force from the strong hive and gives them to a weaker colony. This removes the swarming impulse from the strong hive. Example: Hive A is very strong and is making swarm cells. Hive B is a weaker hive or a new package of bees. Move the entire colony, put Hive A where Hive B is and put Hive B where hive A is. The field bees fly out and then return to the hive where the were before. Hive A gets weaker now with a smaller field force and loses the desire to swarm. Hive B gets stronger with the larger amount of field bees. Hive B now may make more honey than Hive A and it may have an increased risk of swarming. Swarming is always a challenging time of year but employing good management practices will keep the bees at home instead of in a tree somewhere.